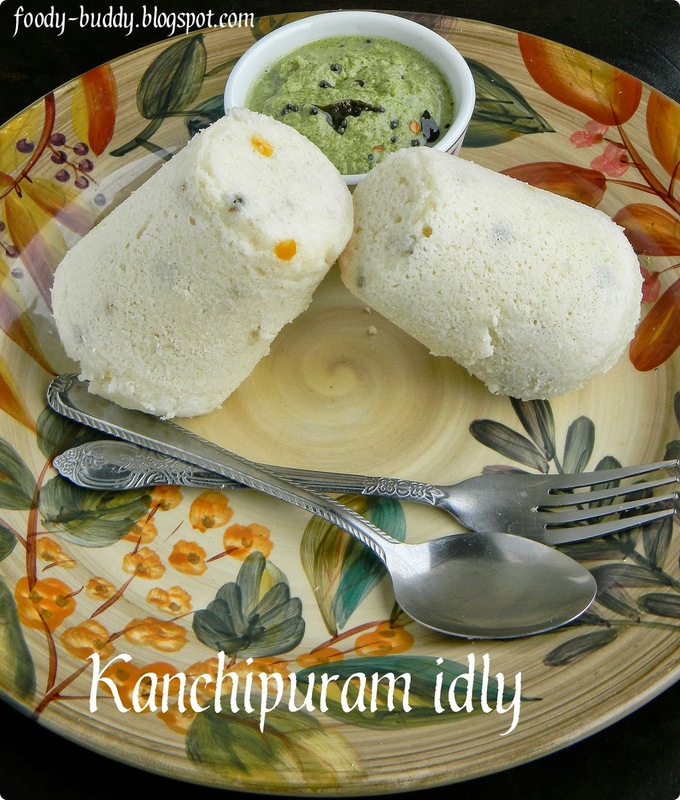 Kanchipuram Idly / Kanjeevaram Idly / Kanchi Idly is a nice variation to regular rice idly (steamed rice cakes). The name originated from the place called Kanchipuram in Tamilnadu, famous for temples and pattu (Hand woven silk) sarees. This idly is mildly spiced and steamed. Addition of spices and ghee gives a nice aroma and taste to the idly. But these idlies are traditionally steamed in dhonnai (dried leaf cups), hence they are also called kudalai idly, which adds an extraordinary fragrance and taste to the idly. Since I didn’t get dhonai in my place, I used idly cooker to steam this Kancheepuram idly. So start your day with this protein rich healthy breakfast. It goes well with peanut chutney or mint coconut chutney or idly podi. Soak the rice and dal in water separately for 3-4 hrs. In a blender (mixie) or grinder, wash the urad dal and grind it to a fine batter, remove it and transfer this to a bowl. In the same blender, grind the idly rice to a coarse consistency like rava texture. Finally add the urad dal batter to ground rice and grind it for another 5 mins. Transfer this batter to a bowl, add salt and mix well. Your batter should be thick, not watery. Let it ferment for 12 hrs. As I am in US, It took 20 hrs to ferment. Soak bengal gram in water for 30-40 mins, drain the water and add it to the batter. Add beaten curds, whole cumin, green chilly, whole pepper, grated ginger, ghee, and salt, mix well. 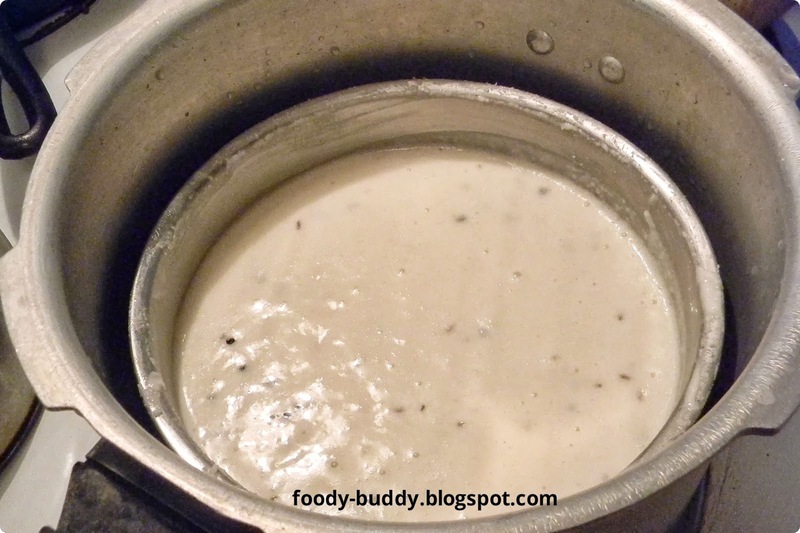 Grease the idly plates or tumbler with oil, pour the batter to the idly plates and steam it for 20 mins. Once it done, turn off the heat and remove the idly plate, let it sit in counter top for 5 mts. Remove the idlis carefully with a spatula and serve hot with peanut chutney or Mint Coconut Chutney. The batter should be coarse like rava (sooji) and thick. Adjust the spiciness according to your taste. You can make idly with idly plates or tumbler or small cups or big stainless bowl or dhonnai, make sure you greased well with oil before pouring the batter. 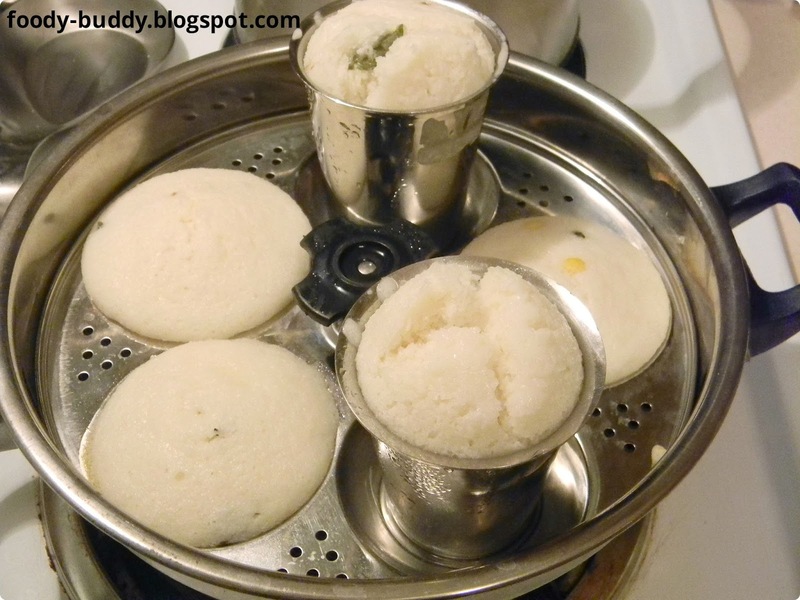 Here I used tumblers to make idly, just pour the batter into the tumbler and keep it in a idly plate, but you can place only one plate in a idly cooker. If your are using big stainless bowl with batter, use pressure cooker, in that case don’t use weight, just cover it with lid. Finally slice it like cake and have it. Use fresh curd to make this idly. You can also saute the spices in oil, before adding them to batter. A dish of rice with dal gives you carbohydrates, protein, fiber and fats for a healthy, balanced meal. The rice provides carbohydrates for quick-release energy & aids in digestion. Urad dal is rich in protein and good for heart. This entry was posted in Breakfast, dinner, idly, Lunch Box Items, South Indian Recipes. I love this idea.. looks so soft and tasty..
Wow such a nice recipe and lovely photos. very nice and nutritious recipe! Beautiful snaps!! Kanchipuram idly looks delicious Love it. omg such an delicious kanchipuram idli love the traditional shape in glass 🙂 looks fabulous dear !! lovely kanchipuram idlis.. Love the tall version.. My mom used to do that way when last 2 or 3 ladels are left after filling the idli plates.. 🙂 And we siblings used to fight for that version of idli, steel glass idlis! Its s soft and delicious dear. My other half will flip upside down if he sees this idly. He a big fan of it but I am so so. I am really attracted to how they came out, soft and yes to the pairing with chutney. 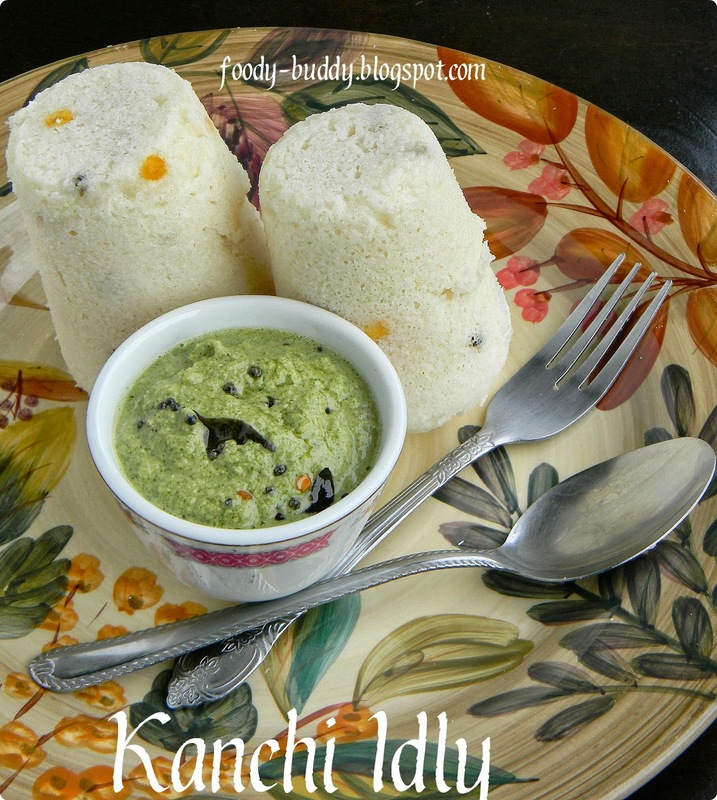 Am a big fan of this kudalai idly but none at home..obviously i do make them rarely..Wish i live near u.
Yummy, comforting and healthy idlis!! Love these idlis, they look so cute in the tumbler shape.. 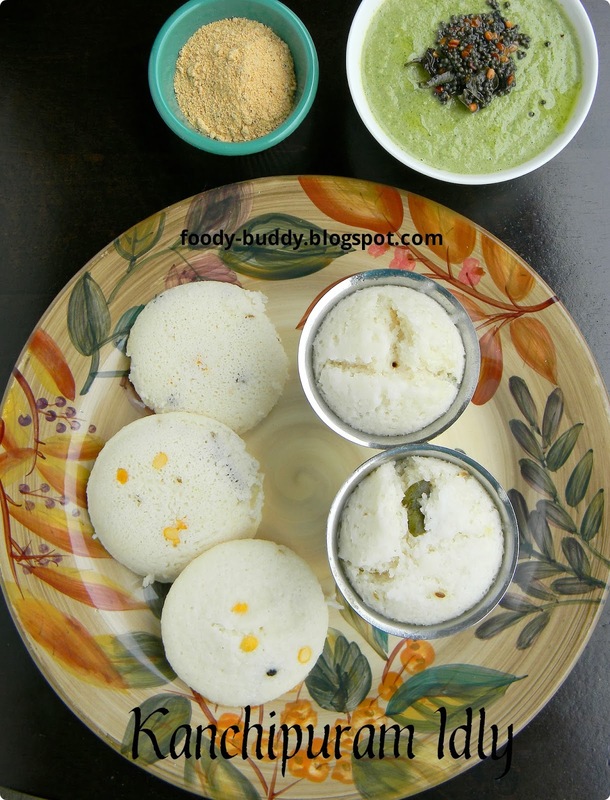 Awesome idlis and wonderful presentation! nice cliks n perfectly done…tempting..